Photo: waterdotorg. Creative Commons BY-NC-SA (cropped). Water is critical to the health of every nation and its socio-economic development and undoubtedly, addressing water-related issues cannot be done entirely in one day. 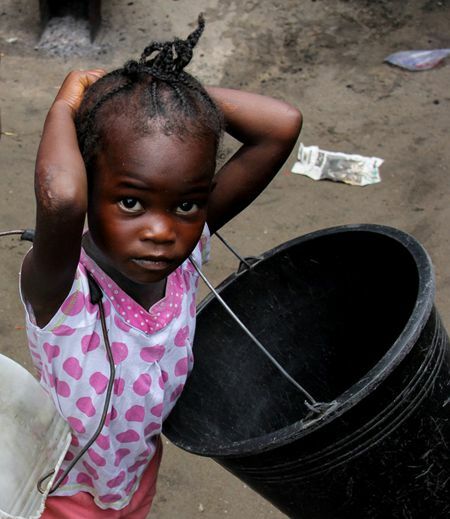 When clean water is unavailable and sanitation is poor, countries suffer a high incidence of diseases like cholera. Nonetheless, for a continent like Africa, World Water Day provided an opportunity to re-examine the challenging work required to halt the pollution of water resources across the continent. The fact is that despite progress on access to safe water in some African countries, two serious problems continue to impact negatively on the continent’s water resources: the warming climate and human activities — including population growth, urbanisation, industrial activities, poor farming practices and, more especially, poor waste management practices. Though Africa is endowed with 63 spectacular transboundary river basins that cover 64 percent of the continent’s landmass, around 40% of sub-Saharan Africa’s 783 million people have no access to an improved source of drinking water. The region also has the lowest household daily water use per capita in the world; a consumption rate far below the UN minimum personal and domestic consumption level of 50 litres per day. Photo: Travis Lupick. Creative Commons BY-NC-SA (cropped). 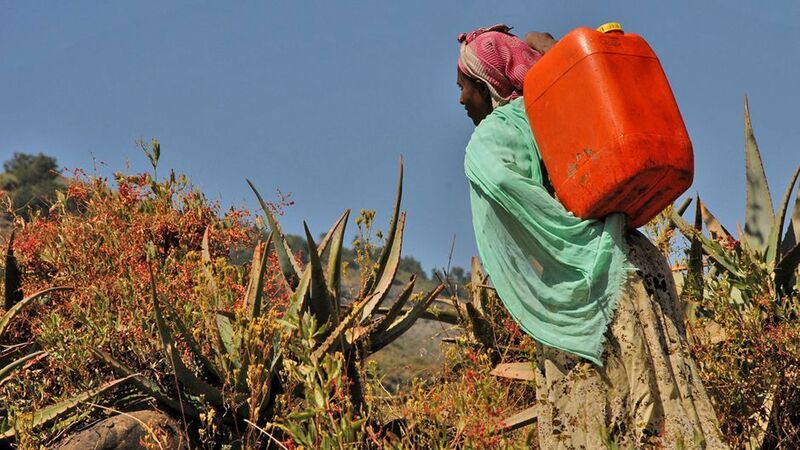 Further, women and young girls — usually the ones to search for the water needed to meet families’ daily needs — spend hours of their day walking miles to the water source and carrying filled containers back home. This prevents them from engaging in other income-generating activities or attending school regularly. 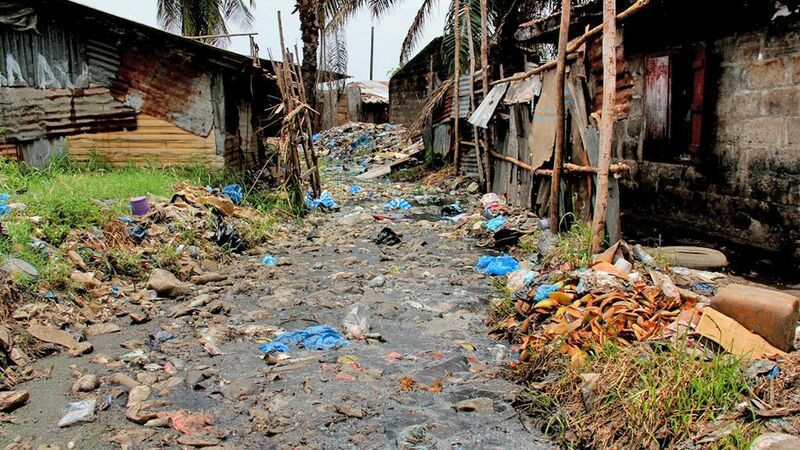 This unfortunate situation, coupled with the health implications of using polluted water sources to meet basic domestic needs, provides ample reason to call for a revolution against water pollution on the continent. 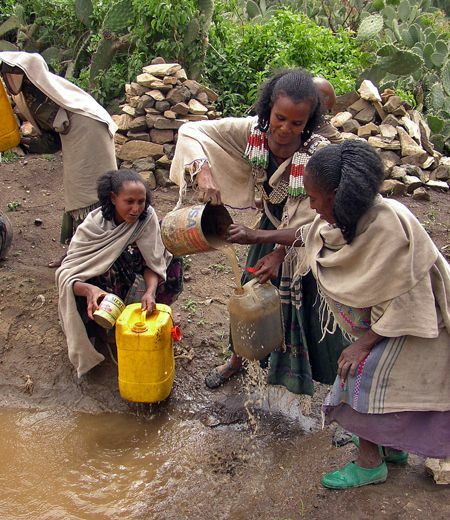 Women collecting water from an unsafe source. Tigray, Ethiopia. Photo: waterdotorg. Creative Commons BY-NC-SA (cropped). Another approach that would have a huge impact is to boost innovative science and technology research, believes Dr Effiom Oku, Land and Water Resources Research Fellow at UNU-INRA. He observed that “science and technology are the obvious means of changing the trajectories for harnessing Africa’s water resources so as to create wealth, produce enough food and reduce poverty”. Dr Oku indicated that there are a couple of areas that will be key in addressing the continent’s water challenges. One of these, he said, is to explore cost-effective technologies such as the use of vetiver grass to treat wastewater for reuse. He further noted that available evidence suggests that investing in more advanced technologies such as reverse osmosis for desalination would be very beneficial to many communities in dry areas, mainly because of its low operational cost, especially with regard to energy. There is no doubt that water resource management must be prioritised to drive sustainable development. Behavioural change on the part of Africa’s citizens and industries will also be key to halting water pollution. This will require that citizens resist dumping waste and excreta into drainage areas and water resources. More importantly, there is a need for increased awareness and educational campaigns by advocacy groups (such as civil society organisations) on the impact of water pollution on health and the environment could help to boost public knowledge. Freshwater Scarcity: Recapturing Africa’s Vital Resource by Praise Nutakor is licensed under a Creative Commons Attribution-NonCommercial-ShareAlike 4.0 International License. Praise Nutakor is Communications and Public Relations Associate at UNU-INRA.